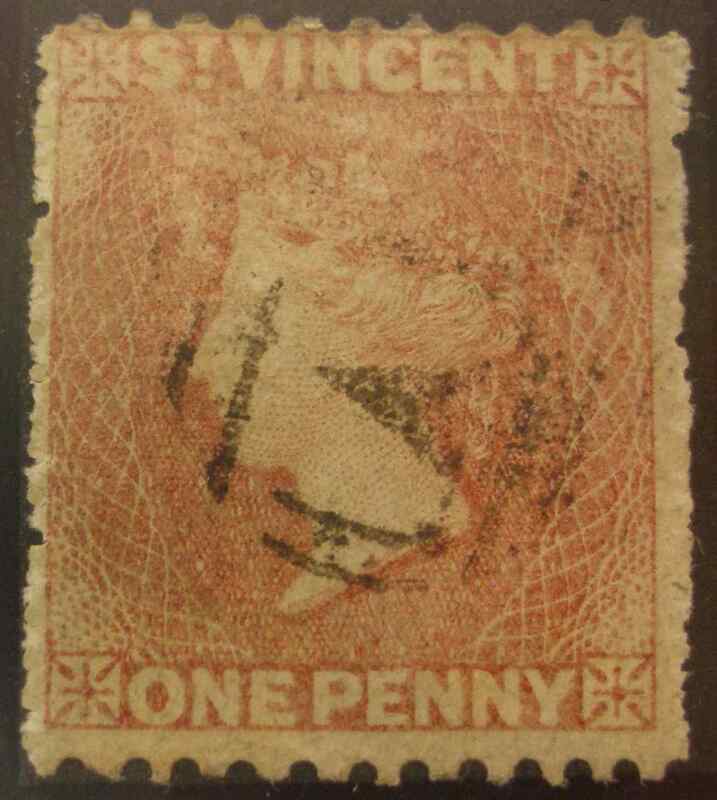 The St. Vincent "1 Penny Red" stamp is often a source of confusion for many collectors. 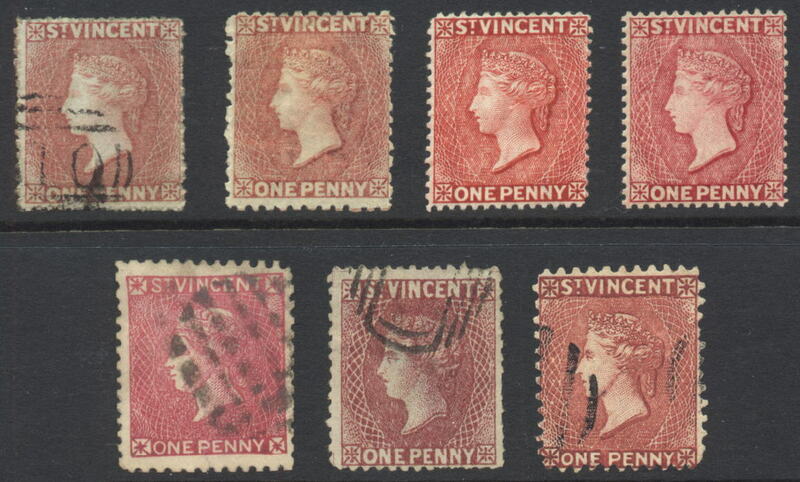 Using the Scott catalog as a guide, many collectors simply stop at Scott #1 or #2, as it is generally the first "1 penny red" stamp that one runs across in the catalog. If one delves a bit further into the catalog, there are three other commonly found 1 penny red stamps to be found: Scott #5, 43 and 44 (plus the elusive #11). Row 1 of the image above shows Scott (Stanley Gibbons) #2 (SG#1), 5 (SG#5), 43 (SG#48) and 44 (SG#48a). Row 2 of the image above shows 3 forgeries. The 1st stamp is not attributed to any specific forger, the 2nd one is a lithographed forgery from the Spiro Brothers of Hamburg (approx. in the 1870-1880's) and the 3rd one is an engraved forgery by Panelli (approx. 1927). November 12, 2006 addition: the left stamp on row 3 above shows the elusive Scott #11 (SG#10). The color is normally identical to #1, #2 or #5, however, the picture was taken under office lighting and not via a scan, hence the appearance here is different. The stamp shown did have a BPA certificate and permission was granted from the present owner, Crown Colony Stamps, to use the image. The right stamp is also a Scott #11 (SG#10) but came from a Spink auction catalog image (from the May 3-14, 2008 Sovereign sale). Note: the stamps in rows 1 and 2 are from my own collection. The design on #43 & #44 appears sharper. #1 has relatively "clean-cut" perforations 14 to 16. #2 has rough perforations 14 to 16, although "compound" perforations are also known. #5 has clean-cut perforations 11 - 13. #11 has clean-cut perforations 11 - 13 at top & bottom, and rough-cut perforations 14 - 16 on the sides. Generally speaking, #1, #2, #5 & #11 will have "A10" postmarks, while #43 & #44 have postmarks identifying the town (either fully spelled out, such as "Kingstown", or less likely with single,double or triple letter village abbreviations) plus the date. Generally speaking, Scott #43 and 44 are often mistaken for either #1, #2 or #5. Many collectors do not have the various stamps available for comparison, so they are easily be misidentified. Using the visual guide above should pretty much help you identify what you have. Additional scans of St. Vincent Fakes & Forgeries can be found at Bill Claghorn's "Comparative Philatelic Forgeries" website at: http://www.geocities.com/claghorn1p/StVincent/index.htm . I have sent him scans of most of the known St. Vincent forgeries and he has listed them on his site.